Arctic Cat 700 CP Pistons, for those that demand the ultimate in engine performance! We are proud to be a dealer for these premium performance Arctic Cat 700 pistons. Whether you are looking for more performance for trail riding, off road racing, mud bog competitions or just about any other application, these forged CP Pistons offer greater performance and durability. Get the best Arctic Cat 700 piston, use CP Pistons. We offer reasonable pricing, fast shipping and technical assistance should you need help. We appreciate your interest in our products and look forward to getting the opportunity to assist you.. Please contact us with any questions that you have and we will be happy to help. NOTE: If you have a 2008 or earlier Arctic Cat 700 with the Suzuki produced engine, please see this page Suzuki King Quad of our website. NOTE: If you have a 2008 or earlier Arctic Cat 700 with the Suzuki produced engine, please see this page Suzuki King Quad of our website for the correct pricing. The prices listed below are for the Arctic Cat produced 700 engine which is more expensive to machine than the Suzuki produced cylinder. The below listed combo kit part numbers include a CP Piston kit, Cometic head gasket, bore and replate of your cylinder AND the big bore deck conversion modification to your cylinder. Save money and time by buying one of our combo kits. Q. What is a "deck conversion" and why do I need it? A. 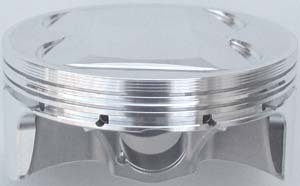 When you bore the stock cylinder oversize to accept the big bore Arctic Cat CP piston, you decrease the surface area of the cylinder head that is available to help seal the cylinder to the head gasket and cylinder head. This decrease in area also decreases the "clamping force" of the head to the cylinder, which helps to insure proper head gasket seal. To insure maximum performance and durability we STRONGLY recommend having the deck conversion modification work done on any big bore Arctic Cat. See below for before and after pictures showing the deck conversion. This image shows a stock Arctic Cat 700 cylinder top view. From the factory the water jacket area around the cylinder is totally open. 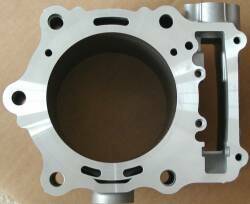 It is much easier and less expensive to produce the cylinder this way, but it decreases the area available to clamp the head gasket between the cylinder and head. This image shows the cylinder after having the deck conversion modification performed and being bored oversize. 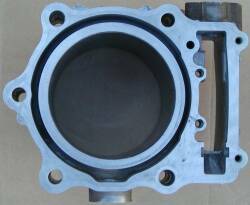 You can clearly see that there is much greater surface area for the gasket to seal the head to the cylinder, even with the oversize bore. The deck area is also much more stable with this mod. Cooling is not compromised as the slots and steam holes are located to maintain proper coolant flow. If you elect to purchase one of the Arctic Cat Big Bore Combo Kits you will need to ship your clean, dry cylinder to us by a reliable, insured, tracking number included shipping service. All fittings, o-rings, bolts, etc. should be removed from the cylinder before you ship it to us. The cylinder MUST be degreased before shipping. If you do not have access to a parts cleaner the easiest way to remove the oil is with a spray can of brake cleaner. Any cylinders that are received that are still oily and / or that require us to remove parts will be subject to an additional labor charge for us to do this work. If you have any questions about this procedure please feel free to contact us and we will be happy to help. Here is a cool video of one of our friends and customers Dwight Stelly racing his Arctic Cat using one our full big bore combo kits. For several years the Arctic Cat used the exact same engine as the King Quad, but eventually Arctic Cat came out with their own design engine. The Arctic Cat cylinder is a bit lighter and designed slightly different than the Suzuki KQ version. Mr. Stelly worked with us to come up with a combo kit for the later model Arctic Cat models. Dwight is on the white AC that starts second from the left in the video. We would like to thank Dwight for his help with the Arctic Cat big bore kit planning, testing, development and for sharing this video with us. Thanks Dwight!